Owen is always hungry. At least, he pretty much never turns down food. He will not eat asparagus these days, and he doesn’t like eggs too much. True he picks the onions out of any dish that they are pick-out-able and leaves them in a pile on the plate. But that’s about it. As a little guy seated in the front of the grocery cart, I remember Owen reeeeaching down behind him into the cart to grab the broccoli up and gnaw on it as we shopped. What could I say? Nowadays, he will eat an entire extra-large bag of pears from BJs Wholesale Club in a couple hours if I don’t hide some of them first. Is he really hungry? Or is this a behavior? Boredom? Some version of sensory under-stimulation that causes him to eat and eat, as if he can’t tell what full feels like? Another possibility could be that his “Specific Carbohydrate Diet,” (click to read more: http://www.breakingtheviciouscycle.info/), somewhat similar to that trendy word “Paleo,” means that he needs to eat more to replace those filling grains he isn’t eating. I know while I tried eating with Owen for a while the lack of grain bulk left me kind of empty. Last Friday we had a party at our house that left behind part of a massive chocolate cake. I stored the leftovers for Sunday church refreshments. I didn’t realize that Owen had been raiding the fridge until Sunday morning when I discovered crumbs and a diminished under the foil cover. There will be hell to pay this week, I expect, as the problem sugar/starch molecules work their way out of his system. Carbohydrates like that affects Owen’s mood, and gums up his ability to communicate as it also gums up his bowel. His face is less expressive. Oh – and he didn’t want to eat much all day Sunday. But I believe in a period of “carnival” now and then. We all do it. Why not Owen too? For one thing, I am hoping he will develop awareness of what feels better – as I hope for the sensitive-systemed eaters in my care. Don’t laugh. 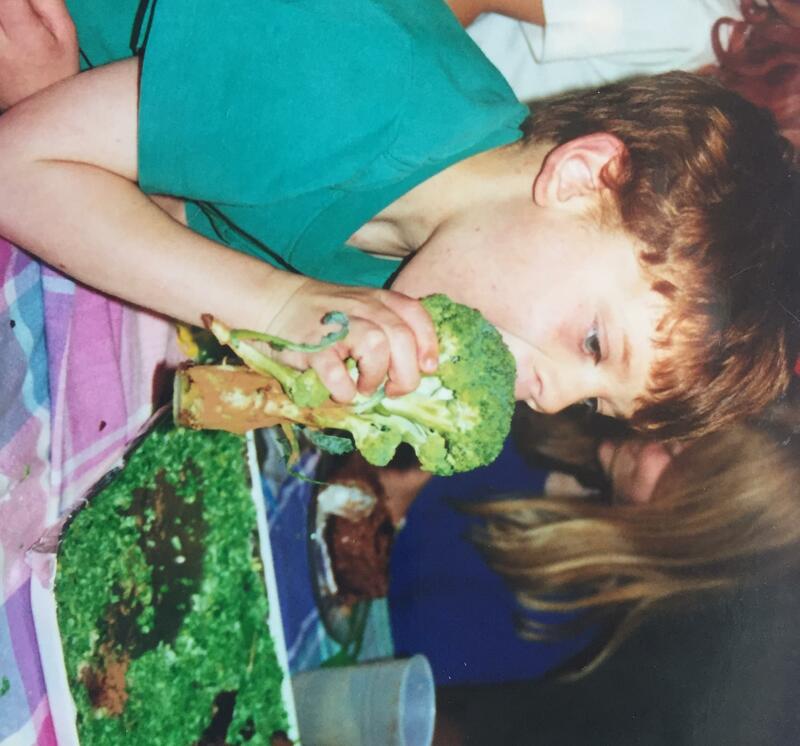 Remember this is the kid who chewed on the broccoli tree instead of the chocolate castle cake, long before his SCD Diet began. This recent fridge raiding reminds me that increasingly Owen notices what he isn’t getting. And after getting mad at him for getting into what I have been sneaking myself ever since Friday – sugar in all it varied forms – I know that it is time for a shift. Owen is 21. He is not a little boy anymore. True, he will always need support, and to be prevented from eating stuff off the floor, or emptying the fridge of its contents entirely at will. But he needs some “self-serve” options. 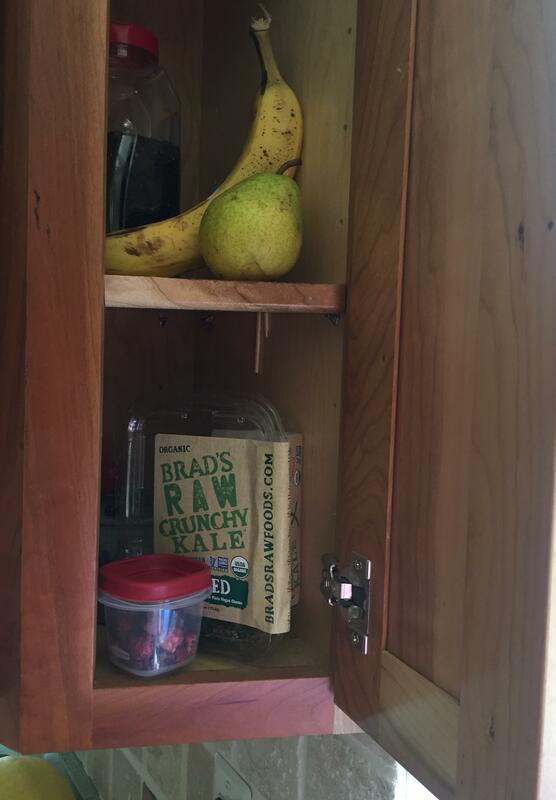 I determined that will set up that snack cupboard that I have been intending to set up for him, one that he can get to from OUTSIDE the kitchen. And now that the party cake and candy are gone (what a shock for my kitchen raider early Monday morning!) we will all have to cope with the intense sugar cravings and frenzy that happens to all of us here at the Simonses’ when we have strayed. Owen takes this directive seriously. When the clocks change and Mom begins to drag him from bed an hour earlier, it unsettles him (I think) and he responds by waking even another hour earlier. At 5am (formerly known as 4) he can be found in the hallway, in the bathroom, in the kitchen rattling through the recycle bin. Someone told me once that if I asked “why?” there would always be someone else wondering the same thing, who would be glad I did. No such thing as a stupid question. I doubt this. Luckily Edward sleeps pretty much like one of Thurber’s uncles, rumbling along peacefully under the soothing influence of the sleep apnea machine. Am I waking because Owen is awake? Are we that psychically connected? Or am I waking him up – because we are psychically connected?? Springing forward with the tweeting birds and chewing mice (squirrels? bats?) and wandering Owen leaves me rattled at this time of year. Luckily I can and do visit my doctor for some gentle homeopathic remedy to break the cycle of madness. I will be able to sleep again, and so will Owen. We will adjust. But – wouldn’t it be easier if we left the clocks alone? I do seem prone to these sorts of questions. Instead, our government intervenes, changing the time of Owen’s meals, changing his rising time, his sleeping time, and therefore his body chemistry and digestive patterns. And, because they cannot understand why it works, it appears they may now prevent our access to the homeopathy, this gentle energy medicine that helps him cope with their intervention, and helps us to cope with him. Uncategorized5p-13, homeopathy, sleep deprivation!, time change for special needs people! This week’s post is late. I have been frozen it seems by incoming very terrible and incoming very wonderful news (one the entwined deaths of a couple I never knew, the other birth of a grand-niece). I feel like a snake after a huge meal, overwhelmed by what I have taken in, passive and digesting. I wonder if this is how Owen feels on a holiday weekend, with all the positive and the disruptive stimulus. But the holiday is over, and his mom is still blank, adrift on facebook, not getting supper on the table on time. Bad news makes the presence of innocence more noticeable. Contrast intensifies our appreciation. Owee woozlings (when Owen lays his face on someone’s neck or shoulder) have increased value. Owen isn’t easy, but he is gentle and pretty sweet even when he is chewing up plastic tomato pots or cutting my cellphone charger cord in two. Over Easter weekend a dear friend sent me a Wall Street Journal article that I share with you here. Please enjoy a peek into another world, captured here by Sohrab Ahmari, in his interview of Jean Vanier, a remarkable, gentle man, and founder of The Ferns (in Paris), and L’Arche movement worldwide.